Volunteers from Corpus Christi Animal Care Services say they're devastated and heartbroken after three dogs were recently euthanized at the municipal shelter and were wrongly labeled as “aggressive." The three dogs ended up in the animal control facility right after Hurricane Harvey ripped through the South Texas area. These are photos taken by volunteers who closely handled the dogs. Corpus Christi held these dogs, and other animals picked up around the time of the hurricane for ten days, which is longer than the shelter's usual three day stray hold time. That additional time was to allow owners to have a chance to claim their pet after the storm. If no one claims a stray dog, it's up to the city to decide the dog's fate. The animal could be put up for adoption, transferred to a rescue group, or euthanized. For these three dogs, the city eventually chose euthanasia. Animal Care Services had the legal right to make that decision, and they don't have to have a reason. The post sent volunteers, who worked with the dogs at the shelter, into a frenzy of anger. That’s shelter volunteer Barbara Brinkman in these pictures with the tan dog. He was one of the three "aggressive" dogs euthanized and referenced in the city’s Facebook post. Brinkman is upset and believes the dog would have been just fine once he left the unsettling, noisy shelter. “He let me put the leash on and walked very nicely even though he was scared," Brinkman said. Now the dog's Facebook post on the volunteer run social media page, which once read, "Sweet calm guy.." reads "no longer available." Brinkman also worked with this brown lab-mix. She said the dog was totally relaxed outside the shelter walls, was certainly not aggressive and never demonstrated unprovoked aggressiveness. Volunteer Nicola Schultz told Watchdog Mary the city's assessment of the three dogs as being aggressive is absolutely not accurate. 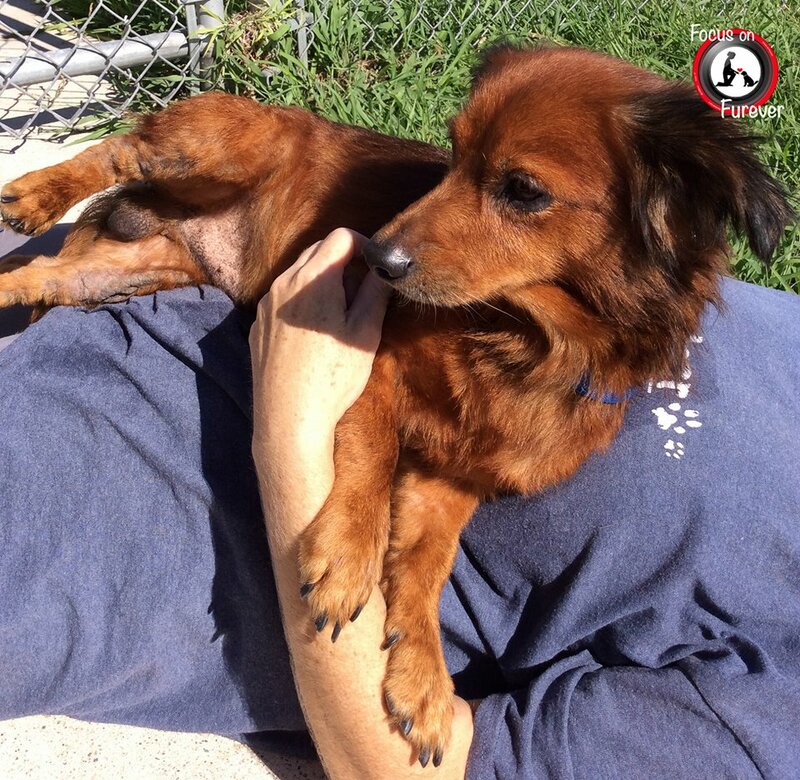 She spent time with the dogs, and had a lot of close contact with this reddish-brown mix, named Brandon. Schultz said Brandon was scared when she first got him out of his kennel but warmed up quickly. "l walked him on leash, I carried him, I bathed him twice since he was so dirty," Schultz said. "Never once did I witness any aggression from him. In fact, he was super sweet, wagging his tail, enjoying the attention. He seemed to enjoy his bath too, letting me give him a good scrubbing." Many animal experts and rescuers know dogs often are scared in the shelter. The barking, the new environment, they’re stressed. Often once you get a dog out the shelter that fear melts away and they mellow out. Shelters can be scary places for dogs. What really puzzles volunteers is if these dogs were aggressive, why weren't they warned before handling them? "Volunteers were not made aware. It should have been noted on their kennel card. Nothing was noted. They mark dogs as aggressive if they are, from what I've seen," Schultz said. Here are the dog's kennel cards. Under the category "Condition During Impoundment" they say "normal", "fearful" and "fearful." According to city officials the dog's "fearful" description is what concerned them. Watchdog Mary had an hour long conversation about these dogs with Captain William Broyles, who runs Corpus Christi Animal Care Services, and Dr. Melissa Draper, the shelter’s veterinarian. They said the dogs were fearful and unpredictable, and Brandon even tried to bite someone. Draper said her staff told rescue groups that help save animals from their shelter about the dogs— but none of the organizations wanted the dogs based on the behavior she and her staff observed and described to the rescues. “We are handling these animals each day, but if rescues won’t take these kinds of animals, my hands are tied,” Draper said. When Watchdog Mary told Broyles and Draper about the volunteer's concerns they both said the dogs demonstrated concerning behavior. “The reality is this is not a dog you can just reach down scoop up and grab. If provoked they may bite and that’s why the rescues would not take them,” Draper said. How exactly were these dogs evaluated for “aggression?" “Unprovoked aggressiveness?" And by whom? According to city officials the assessments were made by shelter staff members and by reviewing their internal notes about the dogs. Broyles and Draper said they understand volunteers may want to have more a of “voice” in decisions made about animals in the shelter. “They have to understand the bigger picture. Animals are coming in and we try to get the maximum number of animals out that don’t have any issues,” Draper said. And what about the city's Facebook post saying the dog's pictures were posted by mistake? "Photographs of these canines were inadvertently taken and posted..."
Broyles said that was an internal error. The three dogs were not supposed to be posted on the volunteer run “Focus on Forever” Facebook page. It’s one medium used to advertise dogs in the shelter. The page features high quality photos of the dogs taken by volunteers so they look appealing to rescue groups and adopters. “We want them (volunteers who post dogs on Focus on Forever) marketing super healthy, super friendly dogs,” Broyles said. Draper then explained, “We do ‘fast tracks,’ when that cute poodle comes in, you want that dog to get into your facility and out as soon as possible. That allows 'slow track' dogs, which are shy or super energetic dogs, or that generic brown dog, those dogs, if you get the fast tracks out sooner, it allows the slow tracks more time to get out," Draper said. 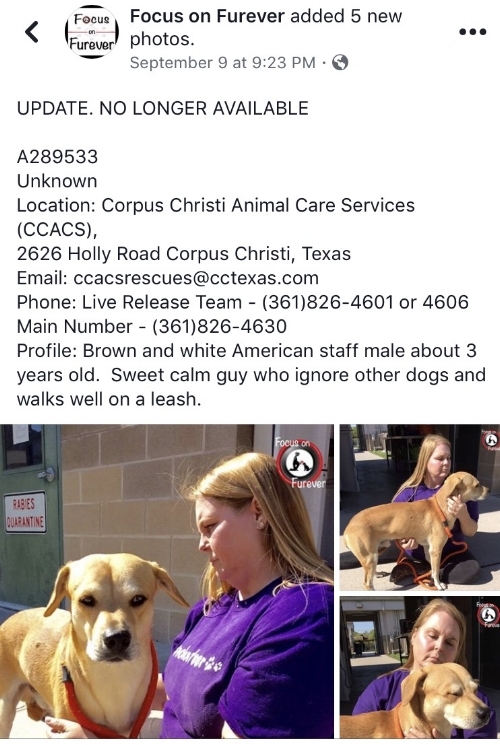 Broyles said the three dogs were held for a couple of weeks and advertised on Snap Chat, Instagram and the main Corpus Christi Facebook page. Shelter officials say they’re in a tough position. They take in between 5,000 to 7,000 dogs and cats each year and they hold off euthanizing animals for as long as they can. “That is unfortunately a decision we make off of space and time. If we have animals leaving quicker and we don’t have space issues we can continue to hold them. If we can’t move the animals out, that’s when it’s a concern,” Draper said. Draper and Boyles said the city struggles with animal overpopulation, and people not spaying or neutering their pets. They also know of cases where animals are being hoarded, and should be removed from the owner, and situations where packs of stray dogs are chasing kids, but they can’t take in those dogs until there's room at the shelter. So not having empty kennels in their animal control facility can be a public safety issue. “We are not a nonprofit shelter, we are animal control. We have to make decisions based on what’s out there. There was one day we had ten dogs chasing kids in two different school sections. We take in all the animals. We have injured strays. We have to pick them all up,” Broyles said. Officials said they try to save as many animals as they can. 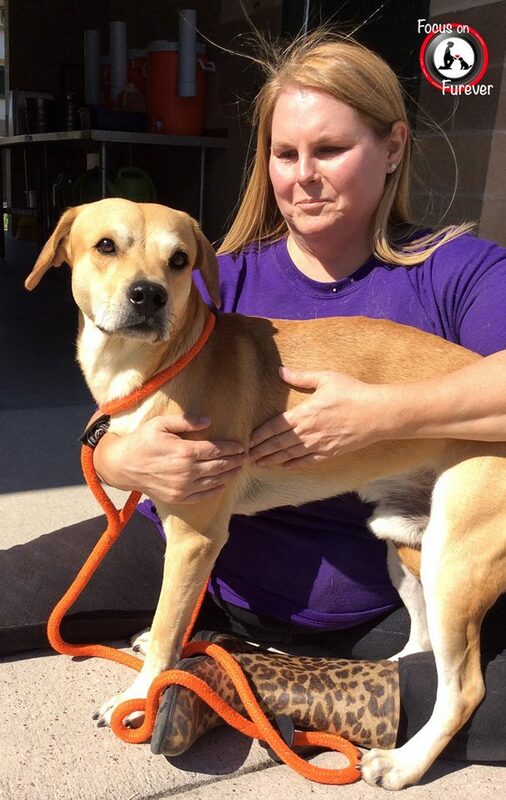 Draper's reference to a "live release rate" means the number of dogs who leave the shelter “alive.” 90% now leave the shelter with an adopter, a foster or a rescue group, instead of being euthanized. But volunteers argue if adopters and rescue groups were told about their own observations of the dogs, they would have had a better chance at being saved. "None of these three dogs so much as growled at any of us during pictures," Brinkman said. "We all know they are a kill shelter, and if they had said these dogs were euthanized because of time and space we would have understood. We wouldn't have liked it, but would have understood. What is upsetting is the fabricated stories and the cover-ups." Schultz said she has sought private counseling because it's so upsetting to learn adoptable dogs were euthanized. "Tears don't even describe the pain I've experienced. I have nightmares because of what I've witnessed. We do it (volunteer) for the pets, not the people. Each one we lose breaks us. I know the truth, so do the dogs. You can see the truth in their faces, in their photos. That's all that matters. Their lives," Schultz said.